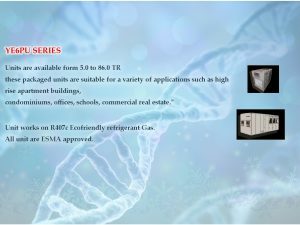 YE6PU SERIES Units are available form 5.0 to 86.0 TR these packaged units are suitable for a variety of applications such as high rise apartment buildings, condominiums, offices, schools, commercial real estate." Unit works on R407c Ecofriendly refrigerant Gas. All unit are ESMA approved.